Film buffs know Colorado Territory primarily as a Westernized re-make of High Sierra. 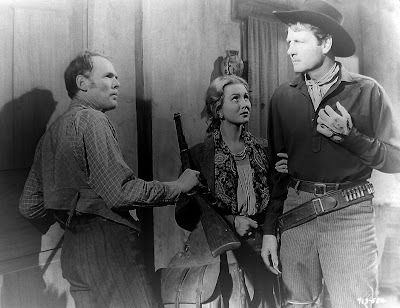 The chief advantage to me of the later film is getting to watch Joel McCrea instead of Humphrey Bogart. McCrea plays Wes McQueen a train robber who breaks out of prison and plans to pull one last big job before going straight. He meets a hard luck rancher who has a pretty daughter (Dorothy Malone). He plans to marry the girl and use the loot from the robbery to stake himself in his new life. His schemes are complicated by his accomplices who want to kill him and take his share. There is also a "bad girl," nick-named Colorado,(Viriginia Mayo) who wants to shack up with him. Never mind the horses and cowboy hats. This is film noir. In typical noir fashion, the hero is neither as good or as bad as Hollywood film poster copywriters would like. The good girl, is actually a bit of a greedy tramp and the bad girl turns out to practically a saint in disguise. Mayo and McCrea are really delicious together and true to the genre (noir that is) their supposedly illicit relationship is actually full of quaintness and purity-- they try to give the money from the heist to a mission church. Director Raoul Walsh who also made High Sierra, and Gentleman Jim, keeps the tension ratcheted up till the inevitable shoot-out in a dead -end canyon. The ending made me think that Bob Dylan must have been watching this movie when he wrote Romance in Durango. That's as much of a spoiler as I'll give you, people. I'm not sure why but Colorado Territory stuck with me for weeks after watching it. I found myself dressing in peasant tops and long skirts and bidding on Navajo jewelery on Ebay. Sometimes a really solid, well-made movie has more staying power than something more ambitious. Colorado Territory is just such a film. I have to go check this out! Jenny, enjoyed your post on "Colorado Territory." If it doesn't reach the heights of "High Sierra," it still provides some great entertainment. It was interesting to see the changes Walsh made to adapt the plot to the Western genre, streamlining the plot a bit in the process. Changing the setting of the finale from a mountaintop in the Sierra to a clifftop cave in the Southwest was a nice touch that really Westernized the film. Using McCrea in the Bogart role created a major distinction between the two films, since these actors had such different screen personas. Trivia note: Henry Hull, who played the doctor in "Sierra," plays Dorothy Malone's father here. Millie: I hear ya. Joel McCrazy, I am. R. D.: I didn't realize that Hull was in both movies. Cool. I agree McCrea and Bogart are really different. I've been trying to love Bogart more lately, though so who knows what strange things will come. Hi, I saw your post. It is very nice. I can understand this. Keep posting like this. Thank you for sharing this post, hope to see more photos and mightystudent.com essay here.